German Pinscher is a medium sized dog that is known for its beauty and brain. He is energetic, affectionate, agile, fearless and mesmerizing family dog. It is the perfect breed for active owners who love to spend time with their dogs. This breed considers themselves as alpha so you need to establish your dominance over the dog. As they belong to terrier family so they are strong willed and assertive. Though small in size but it has attitude as that of large dogs. They are smart, amiable and owners who have experience in dog training will find the breed immensely trainable. They also make excellent watch dog and wouldn’t think twice before attacking on a person. Seeds of socialization should be sown in its mind from childhood. They do not get well along with other dogs and tends to be bossy which could lead to fight. If you are thinking to buy this breed make sure it remains a solo animal in your home. They also have strong prey drives. As the name suggests this breed belongs to Germany. It is one of the reputed Pincher breeds. The breed was developed by cross mating the German Bibarhund and the Tanner. 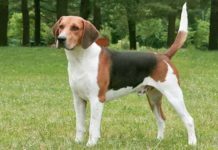 The resultant breed was the hardworking and versatile dog. Historically the dogs were used in protection of estate and property and killing rodents. This dog is ancestor of Doberman and is closely related to Standard Schnauzer. The breed was completely accepted by American kennel club in 2003 and is one of the popular dogs in USA. Their price is $1400 to $1700. 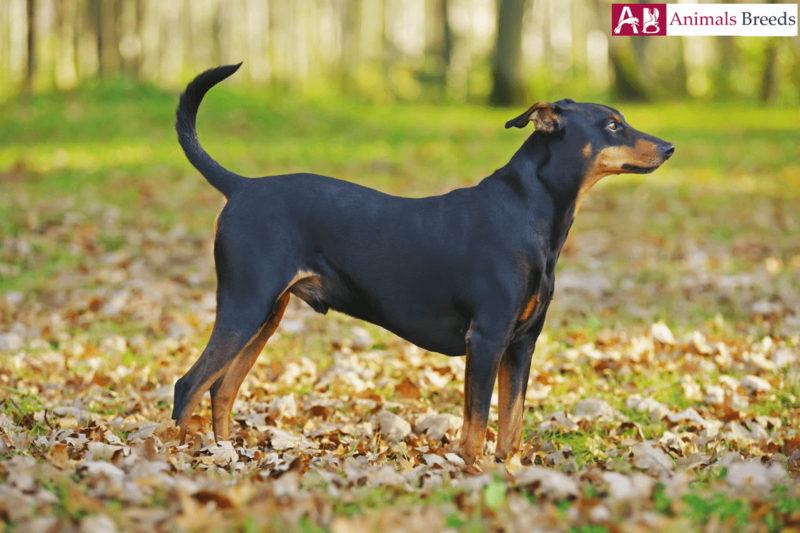 The German Pinscher dog has a muscular yet compact body. The overall body structure is squarely proportioned which means they are equal in length as well as height. They have a wedged shape face and long muzzle. Eyes are dark in color and oval in shape. Tail is naturally docked between the second and third joint. The feet are like that of a cat i.e. round in shape. The ideal height of both the genders ranges from 17-20 inches. Though there are no defined weight parameters but average weight of both the genders should lie between 25 and 45 pounds. Its coat is dense in structure and should have no bald spots. The coat is shiny and short. It is also soft to touch. The coat comes in many colors like black, fawn, blue, red, brown or combination of any two colors. Many dogs sports white marking which disqualifies them from being a show dog but not from being a lovable companion. Personality – It is a fearless companion who is immensely devoted to its family. Despite being medium sized breed, they are wonderful guard dog and take their task of guarding seriously. Under right trainer they tend to be even tempered and well-mannered in home. They have high instinct to prey upon small animals like rats, cats, rodent etc. Because of this reason they are not suitable for family with toddlers. They also tend to have bossy nature and thinks the whole world revolves around them. Behavior – The dog keeps on running and jumping and still never gets exhausted. They love to be included in family activities like outing, travelling etc. This dog is a follower and will even follow you to bedroom or sit with you to watch TV. With strangers they tend to be aloof and reserved and wouldn’t mind biting them. You need to teach your dog about who are the welcoming guests. They are also known to be excessive vocals. Early training can mitigate the negative traits and habits in them. It is recommended that never raise cats or any other animal alongside German pinscher because they tend to eat them. They are also highly possessive and territorial of their toys, place and favorite people. Trainability – They have independent streak in them which make them difficult to obey commands. But under right leadership and positive training reinforcement program they catch skills easily and efficiently. You need to give socialization lessons to your dogs and basic obedience value. If they are trained well they can be ideal pet dog. Activities Requirements – They are not apartment dwellers despite being small in size. They have excessive desire to play, run, and bounce so a yard makes a better place for them. They also have hunting extinct which they can fulfill in the yard or farm. At least an hour of physical exercise is necessary to make the breed happy. You need to give this dog 1.5 to 2.5 cups of dry fruits twice a day. The quantity of food depends upon his muscular built up body, his duration of physical activity and his age. But comparing to other dogs his meal intake is more because dog isn’t a couch potato dog. Do not keep the food on your dog’s plate every time because this can make your dog overweight. The lifespan of this breed is 12 to 14 years of age. They are not hypoallergenic breed. Generally they are considered as healthy breed but few of the health problems which they might get prone to are- hip dysplasia and cataract. Regular checkup of these two symptoms are must for early detection and treatment. They are also prone to clotting of blood. They are a low maintenance dog. Weekly brushing will remove the dead hair and mats if any. Bath only when required or when it emits foul smell from its body. Trim nails if they doesn’t wear it naturally. Regular checking of ears is recommended to see irritation, allergies or wax build up if any. When the dog goes outside to play, you can wipe its coat by soaking cloth in warm water. This breed is not apartment dwellers. They need to be kept in an open and large space which is fenced from all around. They do not thrive in cold temperature and suitable for humid and hot weather. They are also considered as healthy pets. Their grooming needs are low. You need to be committed with this dog else it can turn destructive in nature. This dog demands your ample amount of time.